1) What do both figures relate to? 3) Which aspects of each figure should be highlighted? 4) Should I describe the figures in separate paragraphs, or should I compare different aspects of the figures within a series of paragraph? The table shows the reason why people in Edmonton use their cars in the city and the pie chart explains what type of transport people prefer to use most of the time. 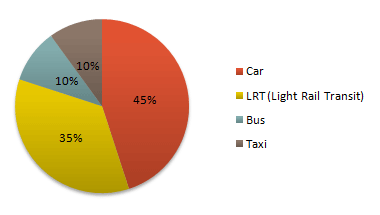 Looking at the pie chart first, it is clear that the car is the most popular means of transport in this city. 45% of the people say that they prefer to commute by car. The second most popular form of transport is the LRT, while busses and taxis are the main means of transport for the rest of the people. The table gives more detailed information about why people use their cars. Surprisingly, 55% of the people need to commute to work by car. Cars are also used a lot for taking children to school or business purposes. Only 15% of drivers are doing their shopping and, similarly, 15% need to travel by car for leisure. Overall, people in Edmonton make good use of alternative methods of transport but there is a heavy dependence on cars for work.